LOS ANGELES - San Francisco 49ers linebacker Aldon Smith was arrested Sunday at Los Angeles International Airport after authorities said he became belligerent during a security screening and threatened that he had a bomb. The 24-year-old player was randomly selected for a secondary screening at Terminal 1 and became uncooperative with the process, airport police Sgt. Karla Ortiz said. She said he told a TSA agent that he had a bomb before walking to the gate. When airport police officers caught up with him, Ortiz said Smith became uncooperative and was taken into custody. A witness's video posted on TMZ.com shows Smith exchanging words with an officer as he was being handcuffed and escorted out of the gate area. Smith was booked for investigation of making a false bomb threat. FBI spokeswoman Laura Eimiller said anyone who makes a bomb threat at an airport is potentially subject to federal charges, although no such charges have been filed against Smith. A message seeking comment from Smith's agent wasn't immediately returned. With the arrest, Smith is involved in three pending criminal cases. 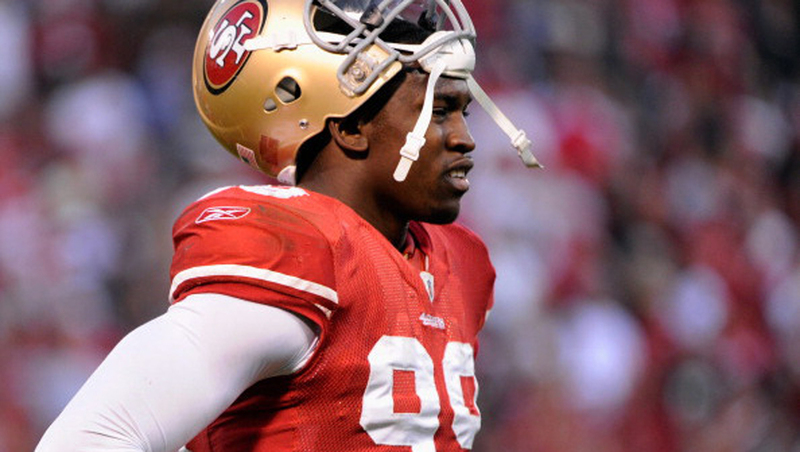 "We are disappointed to learn of the incident today involving Aldon Smith," 49ers general manager Trent Baalke said in a statement. "As this is a pending legal matter and we are still gathering the pertinent facts, we will have no further comment." A fearsome pass-rushing specialist, Smith took a five-game leave of absence from the 49ers last season to undergo treatment for substance abuse. He rejoined the team Nov. 5. Smith played in a 27-7 home loss to the Indianapolis Colts on Sept. 22, two days after he was arrested and jailed on suspicion of DUI and marijuana possession. After the game, he publicly apologized for his behavior and later announced he would leave for treatment. Leading up to the playoffs in early January, Smith said during an interview with The Associated Press he was encouraged by the strides he had made to better himself off the football field that put life - and his work - in perspective. He said at the time he hadn't had any alcohol since before his Sept. 20 DUI arrest, and that he wasn't craving it. When he rejoined the team Nov. 5, he insisted he was on the path to lifelong sobriety stuck by that statement. His teammates rallied around him in support of his rehab and, later, his return to the team. Smith emerged as one of the NFL's most-feared pass rushers in 2012. He had a franchise-record 19.5 sacks that year, but failed to record a sack in his final six games including the team's postseason Super Bowl run. Smith finished with 8.5 sacks and 34 tackles in 11 games last season, making eight starts. In November, Smith pleaded not guilty to three felony counts of illegal possession of an assault weapon, stemming from a June 2012 party at his home. Investigators say several shots were fired, two partygoers were injured and Smith was stabbed. In the subsequent investigation, prosecutors say detectives found five unregistered weapons in Smith's house, including two Bushmaster rifles and an Armalite AR-10T. They say those are assault weapons illegal to possess under California law. Smith and former teammate Delanie Walker were named in a lawsuit last September filed in Santa Clara County Superior Court by a Northern California man who said he was shot at a party at Smith's house on June 29, 2012. The players charged a $10 admission and $5 per drink, the lawsuit said. Smith and now-Tennessee Titans tight end Walker were allegedly intoxicated on Smith's balcony when they fired gunshots in the air while trying to end the party, the lawsuit said. This is the latest in a long list of legal issues for 49ers players. The Niners, who lost to the rival and eventual champion Seattle Seahawks in the NFC championship game, have made nearly as much news away from the field as they have in free agency this offseason. On Thursday, 49ers quarterback Colin Kaepernick was one of three NFL players named in a Miami police report involving a woman who passed out in a hotel and later woke up in a hospital not knowing how she got there, though no one has been charged with a crime. Kaepernick, 49ers wide receiver Quinton Patton and Seahawks wide receiver Ricardo Lockette - a former 49er - were with the woman at a Miami hotel where Lockette lives, according to the Miami Police Department report. The police say it's too early to determine whether a crime was committed.